Independent/Assisted Living suites for rent. First and foremost about people and their personal lifestyles. Located in Coquitlam, BC near Maillardville, Residences at Belvedere is conveniently situated between Austin Heights and Lougheed Mall. Bus service is a short walk away. Access to Highway 1, transit services, major shopping and community services are close by. 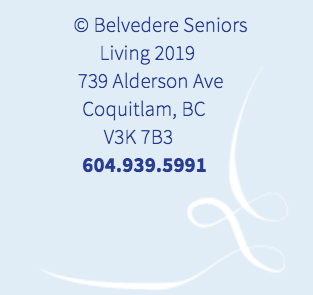 Residences at Belvedere is located adjacent to Belvedere Care Centre, allowing residents to remain in the same Campus of Care if their health needs change. Most importantly, couples can live on the same campus should one of them require additional professional care.